During maintenance repairs on the Idaho Highway 45 bridge spanning the Snake River, Idaho Transportation Department contractors discovered two unexploded artillery shells on separate days. The agency said in a statement that contracted divers inspecting the base of a bridge pier underwater discovered the first explosive ordnance device or EOD on Oct. 31. According to the Idaho Statesman newspaper, officials from nearby Mountain Home Air Force Base said the devices were pre-1970s artillery rounds, adding that the rounds were not from the airbase. The ITD contractor notified the Canyon County Sheriff’s Office when it found the EOD, which helped contact and dispatch a bomb squad from the Nampa Police Department. NPD divers retrieved and secured the artillery round, then shipped it to the nearby Mountain Home Air Force Base, where it was safely detonated off-site. On Nov. 1, however, the contractor’s divers discovered a second EOD in the same area, roughly 20 feet under water. The contractor immediately halted construction and contacted MHAFB, which in turn sent an EOD unit to assess the situation. ITD then coordinated with the Office of Emergency Management, the Air Force, Navy, and local law enforcement, and on Nov. 9, a U.S. Navy dive team removed the old artillery round and sent it to the air base for disposal. 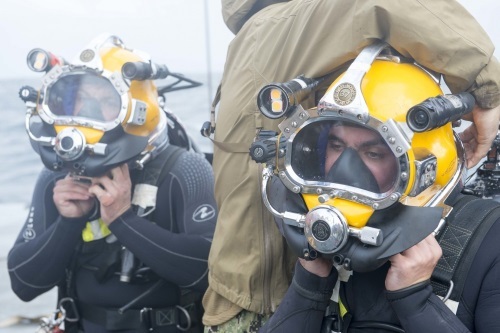 The agency noted that the Naval EOD dive team swept a wide swath of the river bed under the bridge for other possible unexploded ordnance, but located none, allowing ITD’s contractor to resume work. The agency added that it closed the bridge and shut down river access for roughly 20 minutes during the Naval dive team’s extraction of the unexploded bombs.